Natural gas bulls point to fast increasing exports of cheap US natgas to Mexico to bolster their thesis. Even I was guilty of this last year, when I ran a two part series on this in July 2013.But now I’ve learned this is simply not going to happen—at least until mid-2016, simply because the Mexican side of the big pipeline push is not ready for Big Exports until 2016. I found it odd that I hadn’t heard much recently about Net Midstream’s huge 2.1 bcf/d (billion cubic feet per day) natural gas pipeline from Texas into Mexico—which is supposed to start December 2014. A google search showed no new news since December 2013. That’s odd for the biggest cross border pipeline into Mexico in years. This pipeline should be big news in the US and Mexico. 1. 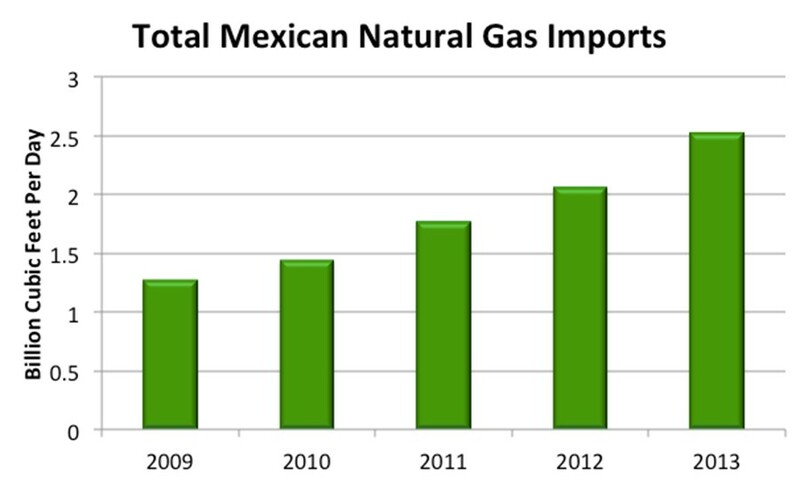 Natgas imports into Mexico are still increasing, but at only 8% so far this year, vs. 30% a year from 2010 to 2013. 2. The Big Mexican Gas Pipe to central Mexico—Los Ramones Phase II—won’t be ready until mid-2016. That’s when the bulls can start to really get excited. 3. In fact, only 30% of the current cross-border natgas export capacity is being used because of internal pipeline constraints. 4. Expensive LNG imports have been filling Mexican demand, though that should peak this year or next. Much cheaper American gas will displace that—but not for a few years, until enough internal pipelines are built in the country. In fact, energy experts Bentek out of Denver Colorado think US natgas exports to Mexico will only rise 1.5 bcf/d over the next five years—a far cry from the natgas bulls thinking 2.1 bcf/d is going over the border this December. 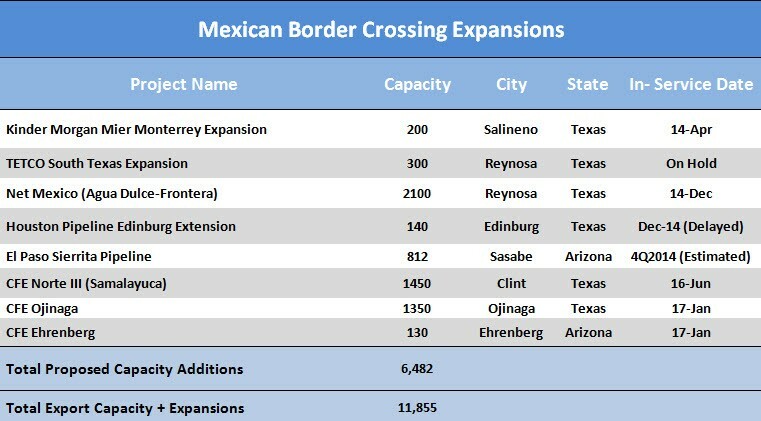 “The infrastructure on the Mexican side to get to demand areas isn’t in place,” says Bentek energy analyst Kaitlin Meese. Bentek, owned by Platts, is one of the top analytical firms specializing in natural gas pipelines and gas flows. 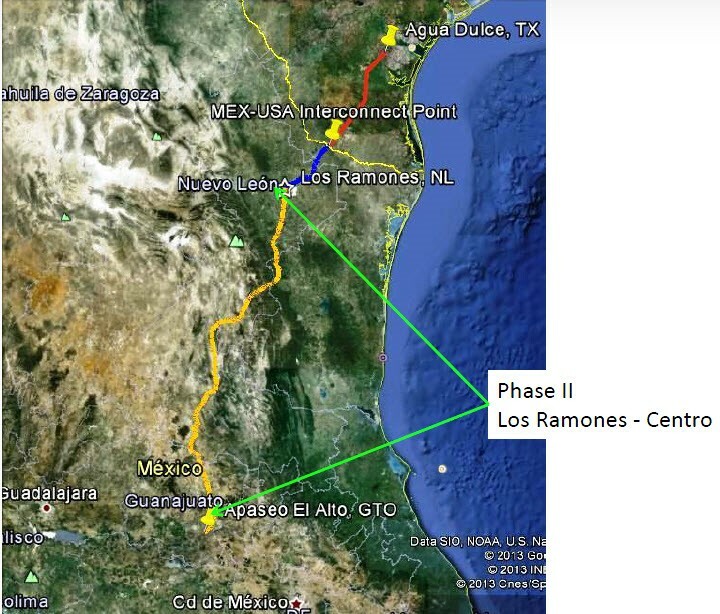 The pipeline on the Mexican side of the border that connects to the big 2.1 bcf/d Net Midstream pipe in Texas is called Los Ramones. The smaller Phase 1 should be ready by December 1 2014, according to FERC (Federal Energy Regulatory Commission) documents. Los Ramones Phase 1 will have a design capacity of 2.1 Bcf/d and will run from the Net Mexico pipeline at the border to Nuevo Leon, Mexico. The problem is, Nuevo Leon is already well served with gas infrastructure. So it doesn’t need that full amount. All that cheap American gas can keep going south—except for the second problem is: Phase II of Los Ramones—which goes down to Guanajuato close to Mexico City–won’t be online until Q1-Q2 2016. Los Ramones Phase II will take 1.43 bcf/d into central Mexico. That’s when US exports to Mexico can really ramp up. Meese says that as a result of those two issues, Bentek estimates that maximum utilization of Phase 1 will be 32% or 670 mmcf/d until the second phase is built in 2016. So the big 2.1 bcf/d pipe export pipe dream will—at most—be just under one-third that amount for the first 18 months. 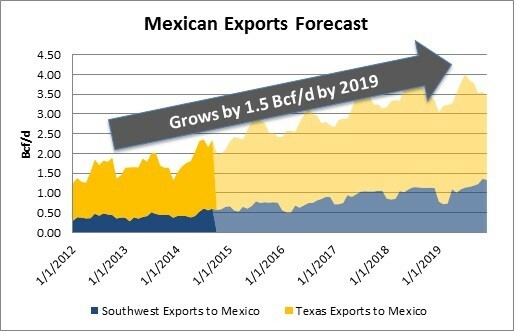 Meese was quick to point out that Bentek believes there is upside to their 2019 forecast of only 1.5bcf/d increase in US natgas exports to Mexico. They are tracking a list of 47 power developments in Mexico that could create up to 4.3 bcf/d of power demand between now and 2026, with nearly 1.9 Bcf/d of power burn coming online by 2019. It’s estimated that PEMEX has costs of $6-$7/mcf for domestic gas, so it makes sense that cheaper US gas could fill almost all that new demand. And as PEMEX moves forward with it liberalization plan, it will be very focused on oil for years—not developing its own natural gas. Aside from NET Mexico/Los Ramones, there are a few other projects on the Mexican side that could theoretically get built faster. But most of these are hooking into small lines on the U.S. side. And most new U.S. pipeline projects are on the order of 0.1 to 0.3 BCF/d. That’s not going to make a huge impact on overall demand when you compare it to total U.S. gas production of 75 bcf/d. The only logical explanation for this is that Mexico just isn’t ready to handle more gas coming from America. It doesn’t have the power demand right now, nor does it have the pipeline capacity down to the Mexico City-Guadalajara corridor. When might that happen? Well, how long does it take to complete a billion-dollar construction project in Mexico? I don’t know—likely no one does, not even the Mexican government. The best guess offered by Bentek—with a lot of caveats—is at least two years. So it turns out, this big story for US natural gas exports to Mexico might not be around the corner but rather a theme to look for in late 2016. That’s the main story. Now, there is a side-bar story to US exporting more natgas to Mexico, and that’s LNG—Liquid Natural Gas. And as the chart below shows—using data from the BP Statistical Review—the hype about rising US imports into Mexico was justified up until the end last year. Between 2010 and 2013, American producers’ shipments into Mexico doubled—from 0.91 bcf/d to 1.8 bcf/d. That rise is what got a lot of analysts excited about the potential for export growth here. But the numbers so far in 2014 are much less bullish. 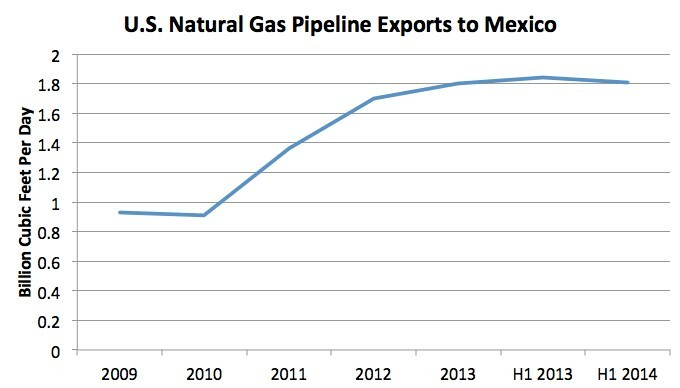 In fact Mexican imports of U.S. pipeline gas actually decreased slightly in early 2014—averaging 1.81 BCF/d, compared to 1.84 BCF/d during the first half of 2013. LNG has picked up the slack—but that’s only going to be temporary; until Mexican pipeline capacity into the industrial central part of the country can displace it. 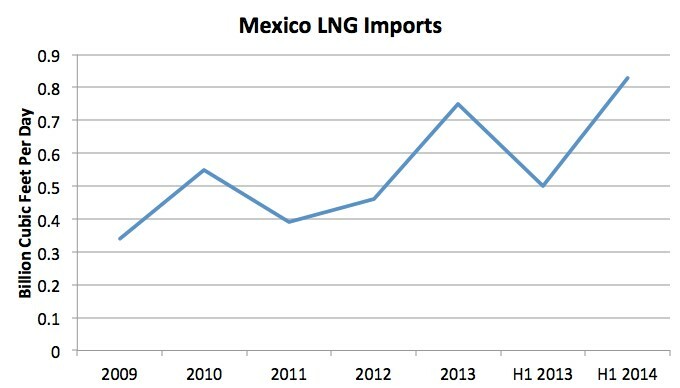 Shipments of LNG into Mexico took a big jump during the first half of 2014—rising 66% as compared to same period in 2013, to hit 0.83 BCF/d. As the chart below shows, that’s a significant rise in LNG supply over the last two years. Mexico will get a break in some of their LNG pricing in 2015 when a 0.5 bcf/d contract with Peru kicks in—at only 95% of Henry Hub pricing (which is one third of JKM pricing). But Wyeno suggests that contract is so out-of-the-market, it could get re-negotiated, and get sold on the open market—creating more room for pipeline imports from the US. So cheap US gas exports to Mexico could displace all the 0.8 bcf/d that is now coming in from (mostly) very expensive LNG—but it will take years to get the internal pipeline network in place to do that. It all adds up to great long term potential for US gas producers—but not in 2015. Previous post: How do you Spend $35 Billion in a Town of 13,000 People?